The trailer has a manual pull out front and manual wind out rear, with the centre extension being completed by the truck to configure the trailer for any container configuration. Our Gooseneck extending skeletal is different from other current European designs, the difference is that the 20’ heavy container can be moved to the rear for unloading in loading bays. The trailer can also be specified to meet ADR requirements. SDC’s gooseneck extending skeletal can carry any container configuration within Europe, including: 1x 45’ 1x 45’ high cube 1x 13.6, swap body 1x 40’ 1x 40’ high cube 1x 30’ 1x 20’ heavy 2x 20’. With SDC's safety first approach, the trailer park brake must be applied to operate locking pins, to ensure operator safety. Manual pull out front for 45’, 13.6m or 40 ft container positions. Manual mechanical wind out rear section for 45’, 13.6m or 40 ft container positions. 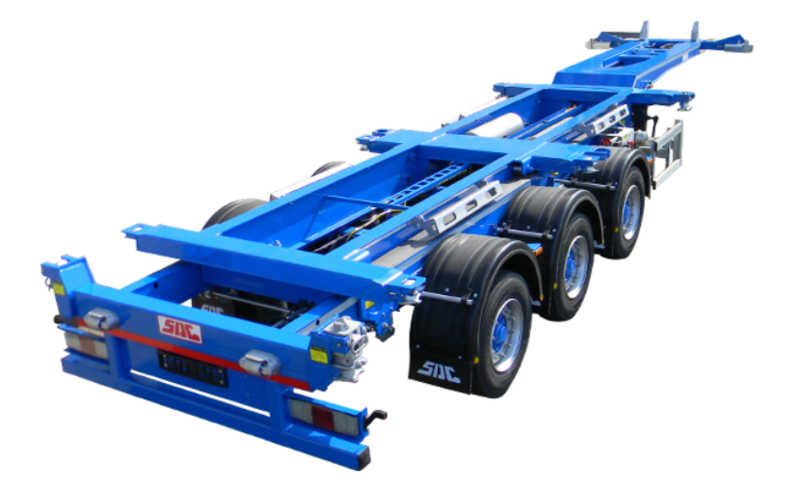 The trailer has a slim neck design with lower profile tyres for reduced centre of gravity, resulting in increased stability and low rolling resistance. Stainless steel wear pads are fitted to the chassis to void the locking pin scoring the chassis and therefore alleviates rusting. Heavy duty steel rollers are used for a longer life. SDC has designed its own front lock system to suit standard and high cube containers.